Sigmar Polke’s series of “Lens Paintings,” which won the coveted Rubens Prize in 2007, seem more like experiments than masterworks. The German artist here developed a new surface for painting: a transparent, resin-based corrugated ‘screen’ that supports imagery both above and below, creating layers in flat relief. The technique is based on a lenticular optical device that allows still images to appear animated if either the image or the viewer changes position. While kitschy mass-produced postcards, and even the magic-eye posters that once hypnotized viewers in shopping malls, work more proficiently at creating a total optical illusion, Polke’s technique aids his painted philosophy—presumably his painting is far too serious to be entertaining; at one point in the show Polke negates the optical illusion by painting on the entire surface of the viewing device. The oft-cited reference by both Polke’s historians and the artist himself is a 1685 Latin text on the telescope. Polke makes his privileged view into this text visible with illustrations of period-costumed gentlemen viewing a dragon. Their sight-lines extend from their eyes to the flying beast, mirroring the viewer’s own efforts to see the choppy images sandwiched in the resin. The corrugated dips and divots on the paintings’ surfaces split our eye into multiple lines of sight, and if we move to view the painting from an oblique angle, we’re rewarded with the otherwise invisible image below. 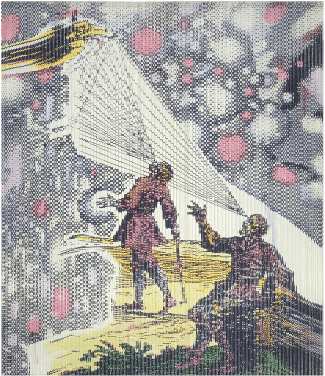 This is a delight for anyone who enjoys optical tricks and holograms—although the pleasure is limited in Polke’s hands. The artist has little in common with the passionate Rubens, and more to do with fellow German painter Hans Holbein, whose 1533 oil painting “The Ambassadors” reveals a floating skull when viewers get on their knees—a reverential pose that viewers are often tricked into assuming.